Alcoholic beverages are a particular concern for dogs at parties. Dogs under the influence of alcohol tend to suffer the same consequences as their overindulgent human counterparts including drowsiness, vomiting, lack of coordination, and slow reflexes. Dogs consuming toxic levels of alcohol may experience depression, breathing and heart rate abnormalities, collapse, low blood pressure, low blood sugar, increased total body acid levels, coma, and death. Hospitalization for IV fluids, monitoring, and symptomatic therapies are strongly indicated for intoxicated dogs. Alcohol is not the only party related concern for our dogs, however. Though several common human foods (like alcoholic beverages) are directly toxic to dogs, other foods that would generally be considered benign may play a role in triggering a relatively common and potentially lethal condition known as acute pancreatitis in dogs. Though the underlying causes of pancreatitis are not well understood, the condition occurs when the digestive enzymes produced by the pancreas become activated prematurely and begin digesting the pancreas itself. One important contributing factor for pancreatitis in dogs is recent consumption of high fat or greasy foods (as often found at a party). Severe cases of pancreatitis result in abdominal pain, vomiting, diarrhea, dehydration, inflamed abdominal organs, and sometimes, death. Unfortunately, treatments are limited to providing supportive care, rehydrating the animal through IV fluid therapy, controlling pain, and a tincture of time. Therefore, preventing access to fatty human foods is the best medicine. Though some dogs would never consider any form of candy edible, many dogs haven’t discovered a type of human food they had the willpower to turn down. Consumption of one favorite Halloween treat, chocolate, is known to have harmful effects in dogs due to the presence of naturally occurring chemicals known as methylxanthines. Two particular methylxanthine chemicals, caffeine and theobromine, present potentially lethal toxicity risks to dogs which consume chocolate. In general, the darker and more bitter the chocolate, the greater the concentration of theobromine and caffeine. Therefore, dogs consuming bitter baking chocolate or cocoa powder are at particularly high risk. Milk chocolate tends to be less toxic for dogs, but can still present significant concerns if eaten in large enough quantities. Clinical signs of methylxanthine toxicity include vomiting, diarrhea, high blood pressure and heart rate, heart arrhythmias, tremors, seizures and death. If prior to 2 hours after consumption, veterinarians will often make the dog vomit and give repeated doses of oral activated charcoal to trap toxins in the GI tract and prevent them from being absorbed. IV fluids, heart rate monitoring, and symptomatic therapy to stop seizures or heart arrhythmias may be indicated. Obviously, the best prevention for canine food and drink hazards is to prevent dogs from coming in contact with them. Making sure to notify your guests not to leave drinks or food at dog level is helpful. However, if you have a notorious canine counter surfer, it may be better to keep your dog isolated from the party in a spare room or a crate until your guests and ghouls have left for the evening. Given many dog’s lack of dietary discretion, the ASPCA Animal Poison Control Hotline is a phone number for dog owners to keep close at hand. For this $65 phone call, not only can you find out if what your dog consumed is poisonous, if you know the quantity of toxin eaten, the staff can also inform you if your dog is at low risk of toxicity or whether it would be best to receive immediate veterinary care. Halloween can be a particularly stressful time for dogs. People in crazy costumes, frequent visits by trick or treaters, or a noisy house party may provide both a reason and an unattended door for a dog to flee the house. Making sure your dog is microchipped and has an up to date profile with the microchip company is probably the best precaution to make sure you get your dog back. Dogs delivered to veterinary hospitals or shelters are routinely screened for microchips and can be crucial for a happy reunion with your dog. If your dog is not microchipped, being vigilant about keeping a properly fitted collar and ID tag on your dog is a tried and true alternative. For some dogs with a particularly anxious disposition, the stressors of Halloween can make for a terrifying time. 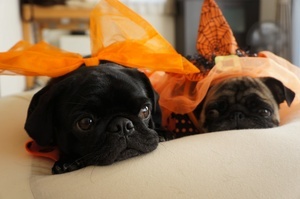 Keeping them in a quiet and calm environment during Halloween festivities can often keep anxious dogs happier and less likely to attempt an escape to avoid the chaos. As is relatively common with fireworks on Independence Day, in rare circumstances, some dogs may be best served by sedative medications in an effort to keep them from hurting themselves or others. If you think your dog is particularly sensitive to the stresses of Halloween, talk with your veterinarian about the best options for your critter. As the cold winds blow and the creepers creep, simple precautions can mean the difference between a happy or downright dreadful Halloween for you and your canine friends. Here is to a very safe and happy Halloween 2017 from all of us at Canine HealthCheck!